In the “male” type of baldness, hair loss begins at the crown and temples, while, in the “female” type, hair loss occurs at the parietal and frontal zones. The first sign of alopecia is a noticeable increase in hair loss, which can be observed most clearly while washing one’s head. As previously mentioned, in men, baldness is most often the result of genetics and is associated with an overabundance of the hormone dihydrotestosterone. Already by the age of 30 years to 35 years, many of those affected will see a bald spot on the vertex. Bald patches at the temples and forehead tend to become noticeable only by the age of 50 years. In women, baldness usually occurs at the age of 50 years. Because of the high content of estrogen in the female body, the androgenic form of the disease occurs much less frequently and is usually associated with a malfunction in the endocrine system. In some cases, however, signs of baldness become noticeable as early as adolescence. Other forms of alopecia (e.g., seborrhea, nest, symptomatic) can occur at any age. 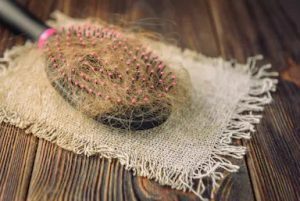 With nesting alopecia in particular, the zones of hair loss are localized on clearly delineated areas of the skin, while, in case of the diffuse type of alopecia, the entire hairline becomes thin. The presence of concomitant diseases (symptomatic alopecia). Any measure to fight hair loss involves elucidating what led to the alopecia at first. After that, the preferred method of therapy is selected, which will typically help by at least slowing if not stopping the hair loss. Cosmetic products. These contain various herbal preparations and nutritional compositions that stimulate hair growth. Examples include shampoos, elixirs, and lotions. Medications. These are usually used in the absence of any visible effect after the use of cosmetology. 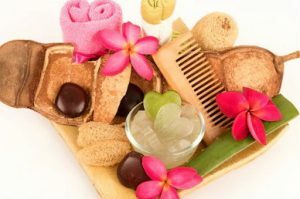 They contain the necessary balanced vitamin-mineral complex, which can normalize the hair structure and growth. Often, doctors advise using a hair growth stimulant like minoxidil in a 2% concentration. Proper nutrition. The food should contain a sufficient amount of vitamins C and A, sulfur, copper, sulfur, and aluminum as well as B vitamins. Therefore, the diet should include dairy products, fish and other seafood, fresh vegetables (e.g., broccoli, zucchini, cucumbers), parsley, spinach, and leeks. The intake of sufficient amounts of zinc into the body can be ensured with the consumption of peas, beans, and beans. Also, unrefined oils (e.g., linseed, olive) and nuts are useful. Cosmetic products. These are largely sold without prescription or limitation. These products can help with treating diffuse alopecia caused by stress or exhaustion after sickness. Shampoos have been proven to be very good options to manage hair loss in men. Medications. In the androgenetic type of alopecia, finasteride is most often used, which makes it possible to stabilize the level of testosterone in the blood. Finasteride is sold under the brand name Propecia® (Merck, Kenilworth, NJ, USA). As the drug has a number of side effects, it is to be used strictly according to a doctor’s prescription. To stimulate the growth of new hair, minoxidil (at a concentration of 5%) can also be used. Proper nutrition. The rules for men are the same as those listed for women: eat more vegetables, greens, and products containing omega-3 fatty acids. As additional therapy where necessary, various drugs can be prescribed to treat diseases that have caused baldness, as can mineral complexes. In addition, regular head massages and the rejection of bad habits is helpful. Finasteride was originally developed for use in people with prostate diseases and had the trademark name Proscar® (Merck, Kenilworth, NJ, USA). During clinical trials, it was found that many patients experienced a side effect in the form of increased hair growth in various parts of the body. 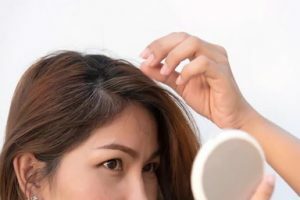 The manufacturing company immediately filed a request with the United States Food and Drug Administration to add finasteride to the list of anti-alopecia drugs. In 1997, this request was approved. Mechanism of action. Finasteride inhibits the level of 5-alpha-reductase, reducing it by 60%, thereby freeing the hair pouches from the harmful effects of dihydrotestosterone. Besides, finasteride acts on hormone levels, specifically reducing the level of testosterone in the blood. Minoxidil’s story is similar to that of finasteride. The only difference is that minoxidil was originally positioned as a drug to manage hypertension. However, like in the case of finasteride, cases of hair growth on the body were noted during clinical trials. The American Hair Loss Association recommends this drug as an additional form of therapy. The mechanism of action of minoxidil is a result of the drug’s vasodilator status: due to this, it helps to increase the flow of blood to the scalp, which has a beneficial effect on the functioning of the hair follicles. Rogaine® (Johnson & Johnson, New Brunswick, NJ, USA), a topical solution that is applied to the scalp and contains minoxidil as its active substance. This medication allows the user to stop the progression of androgenetic alopecia and resume the growth of new hair. It is a reasonably effective medication for hair loss. Unfortunately, after the end of the course of treatment, baldness can resume. This medicine is for treating prostate adenoma and stopping hair loss in men. In contrast to finasteride, it binds to 5-alpha-reductase of the first and second types. The drug affects the cause of alopecia but does not stimulate the growth of new hair, so it is commonly used together with minoxidil. Generally, it retains existing hair and slows further hair loss. Dutasteride is available in the form of tablets (Dutas®) and is taken orally every day. Cosmetological methods help to achieve a visible effect in cases in which the hair follicles are still alive. If there are no follicles on the skin area, only the transplantation of hair from a donor zone into the area of alopecia will be successful. The first is considered obsolete, as it does not allow the achievement of a natural density of the hair and requires the surgical extraction of a skin flap with donor’s hair via a scalpel. Additionally, use of the partially operational method is also not popular, as it excludes the excision of the skin but involves taking donor material with the help of individual piercers, which can leave a lot of shallow scars. In recent years, the highest preference has been given to the nonsurgical method, which involves the manual extraction of follicles. It excludes any incisions, is painless, and allows you to achieve a natural hair density without scars on the donor area. Copyright © HairPlusPills.com. All rights reserved.